Here at last are the four concluding pages of “Raccoons On The Moon”, or, as the Windsongs of Jupiter prefer to call it: “The Raccoons Search For The Meaning Of Life”. 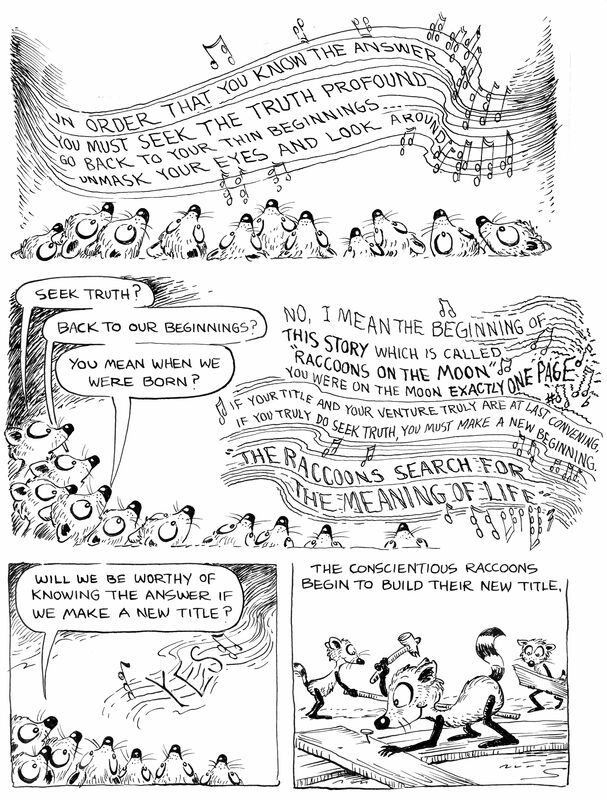 The Windsongs of Jupiter are real sticklers for accuracy, since the Raccoons spent only one page of their story on the Moon, the Windsongs want the story retitled so that “True Truth” will be proclaimed and the Raccoons will be worthy of knowing the Meaning of Life. 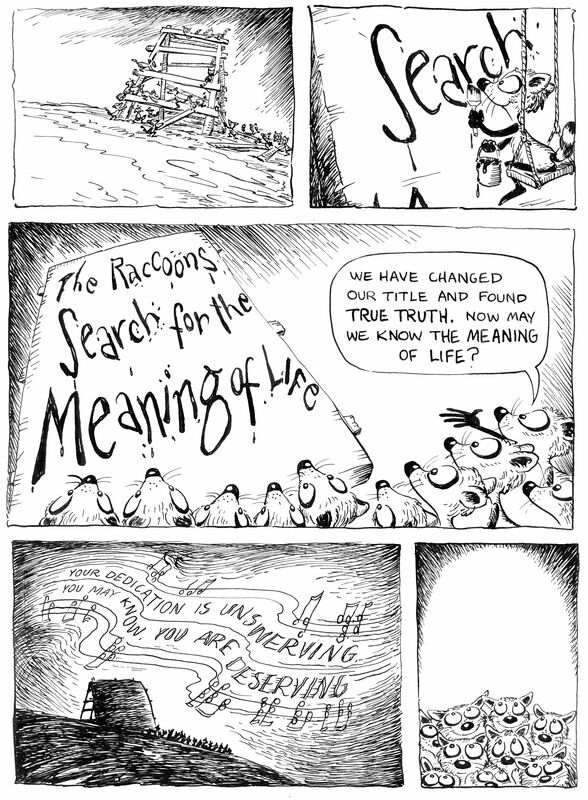 The Windsongs’ definition of the Meaning of Life on page 19 is a real “Shaggy Raccoon” argument, leaving the masked Space Explorers dumbfounded. Note the mixture of expressions in page 19’s second panel as the Raccoons either stare at the reader, or furtively glance at each other. I love Cathy’s timing as page 20 leads off with Virgil saying: “Well, THAT was FUN!” It adds irony to the story’s finish as the Raccoons return to the Moon’s surface. I hope you liked Cathy Hill’s Mad Raccoons and that you will look forward to another one of their unpublished stories coming soon to the Catblog. Felix this time originally appeared in newspapers from 7-10 through 7-16-1933. Felix and Danny conclude their “midget league” baseball season, and Danny’s family go off on a summer vacation without Felix. 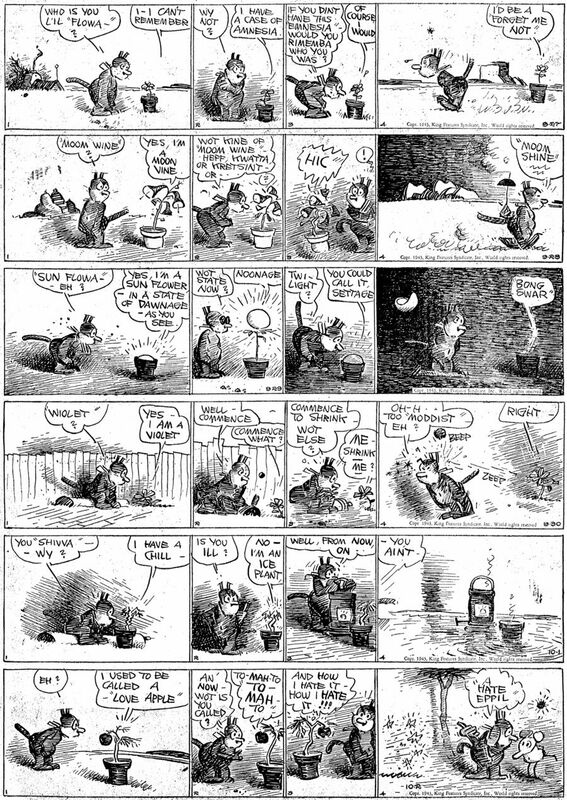 I love the poignant panels in the 7-14 as Felix contemplates a lonely summer without the family. Danny comes back home to pick up Felix and packs him in a bag to smuggle him in to the boarding house where the family is lodging. The Sunday page features Danny and Felix watering an Elephant to earn Circus passes. The Elephant is dry as the Mojave and drinks the landscape to the sandy dregs. Here’s Dudley Fisher’s Myrtle from 4-11 to 4-17-1949. All the dailies are devoted to “Wilbur”, the family’s wacky goldfish. Wilbur doesn’t get along with anybody, not Sampson, Myrtle’s Pop, Slug or the local bird family. The 4-16 has the best Fisher timing of the week, since goldfish are “harder to give away than kittens”, Pop dumps poor Wilbur in the river. A panel later there is a knock at the door, and Wilbur comes bouncing in! The Sunday page is the usual visual feast as the family dusts the household carpet for spring cleaning. The Kat this time is from 9-20 to 10-2-1943. The first batch is mostly odd gags, but the 9-24 and 9-25 refer to Brazil, which was a hot topic during World War Two, what with the Good Neighbor Policy being in effect and all. But what is that creature in the 9-25 with the head of Krazy Kat and the body of a spotted cat? It is a species of Brazilian wildcat called “Oncilla”, “tigrillo” or “tigrinas” depending on which part of the country they come from. They are smaller than a Margay, which is a pretty small wildcat. Garge must have been a student of cats worldwide, both wild and domesticated, to come up with a gag like this one. In the 9-27 to 10-2 batch, the gags are all about plants and flowers, such as a shrinking violet that throws stones at Krazy’s “bean” and a sunflower that rises and sets and says “Bong Swar” to Krazy. But the most obscure reference is to the tomato (or “to-mah-to”) as a “Love Apple”. “Love Apple” is derived from the Italian word for tomato, “pomodoro”, which the French freely translated as “pomme d’amour” or “Love Apple” in English. The “to-mah-to” is a reference to the Fred Astaire 1937 movie “Shall We Dance” and the song “Let’s Call The Whole Thing Off” (you say ‘tomato’ and I say ‘tomahto’). Maybe Garge liked that movie and built the 10-2 gag around the song? KURT’S CORNER Here’s another little remembrance of my dear brother Kurt, who passed away in January. 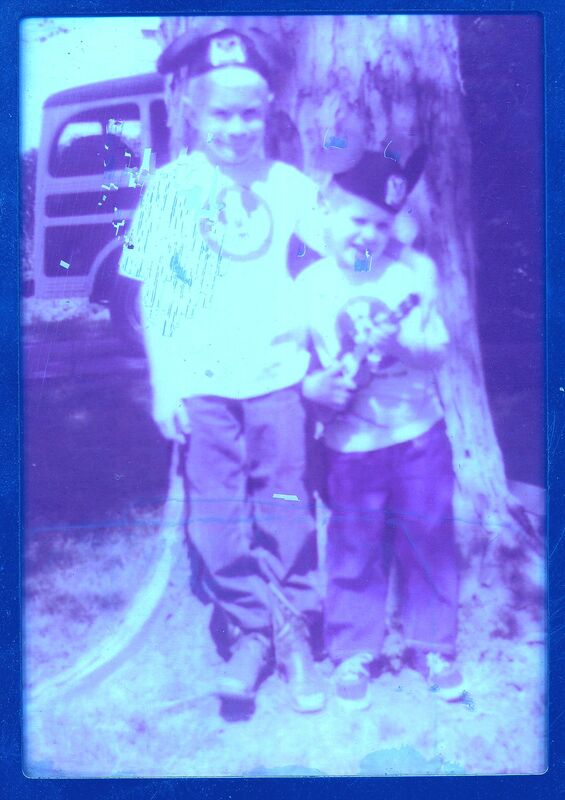 That’s us in the faded and worn photograph of 1956. Probably taken in the backyard of our family house in Crestwood, Mo. 701 Hutchins Drive. The house is still there today, I wonder if that tree is still there? The Mickey Mouse Club TV show was a never-missed event every weekday afternoon, and we had all the gear, Mickey ears, shirts and Kurt is playing a Mouse Ge-Tar. The photo looks blue because it was faded nearly pink and I flipped the color so you could see it better. You can tell that Kurt had a very irreverent attitude from a very early age. He is obviously “Putting It On” as you can tell by the little sneer on his face and the sassy tilt to his head. Even his fingers have attitude as he strums a guitar that was really a wind-up music box. It seemed the entire neighborhood of kids came in to our living room each afternoon to watch the Mouse Club with us. We must have had one of the few TV sets, and poor Mom had to serve beverages and cookies to the hungry little Mouse Clubbers. We all loved Annette and thought that Jimmy Dodd was like a minister with his little aphorisms in song form. Of course they built Jimmy a REAL Mouse Ge-Tar full size! But my favorite feature of the Club was the old black and white Mickey Mouse cartoons. For some reason they fed in to Kurt’s and my fascination with everything “old” and “antique”. We were fascinated by the very primitive and bottle-nosed Mouse that was in the old cartoons. I guess the Disney Studio wasn’t concerned with the original dotted eyes Mickey appearing alongside the exceedingly cute and almost child like Mouse that headlined the Club TV shows each day. We used to have fights over which of our toys was the oldest, and sometimes even such things as spoons and salt shakers entered into the “antique” debate. Disney dominated our lives in the late 1950s, we both had Davy Crockett hats and Kurt and I were Civil War buffs so “The Great Locomotive Chase” really excited our imaginations. Fess Parker traded in his Crockett hat for an engineer’s cap in that one. Last time I posted one of Kurt’s “Mickey Mark” cartoon drawings which I believed to be the last one he ever drew. I was wrong, the one reproduced here is really the last, he sent it with the 2018 Christmas card. It’s a celebration of Mickey’s 90th anniversary. I love Kurt’s caption as he refers to the Mouse being a “corporate symbol, a pawn of copyright extension (just look up the Sonny Bono Copyright Act), a union busting rodent (probably a reference to the Disney strike of 1941)”. I don’t know what the little female mouse means by “Sparta-Mouse”, although it might be a misspelling of “Spatha Mouse”, a special computer mouse for gamers. But “you have delusions of grandeur” was a favorite phrase of our Mother, whenever Kurt or I got too ambitious and dreamed too big for her taste. She probably got the phrase “delusions of grandeur” from a psychology book or newspaper article and took it to heart. For some reason, neither Kurt nor I ever forgot that phrase or Mom’s use of it at times when we could have used a word or two of encouragement. I wish I could have talked about Kurt’s last Mickey Mark cartoon with him, but what turned out to be our last telephone conversation was filled with the usual nonsense and Kurt’s sidesplitting and VERY irreverent imitations of Linda, his girlfriend of many years. Kurt really did love her, but he also loved to make fun of her, as he made endless fun of Mom and our Grandma Katie. I can’t begin to tell you how much I would give to hear him do his “fussy female” voice one more time. Perhaps there will be more Kurt’s Corner features in our next edition. 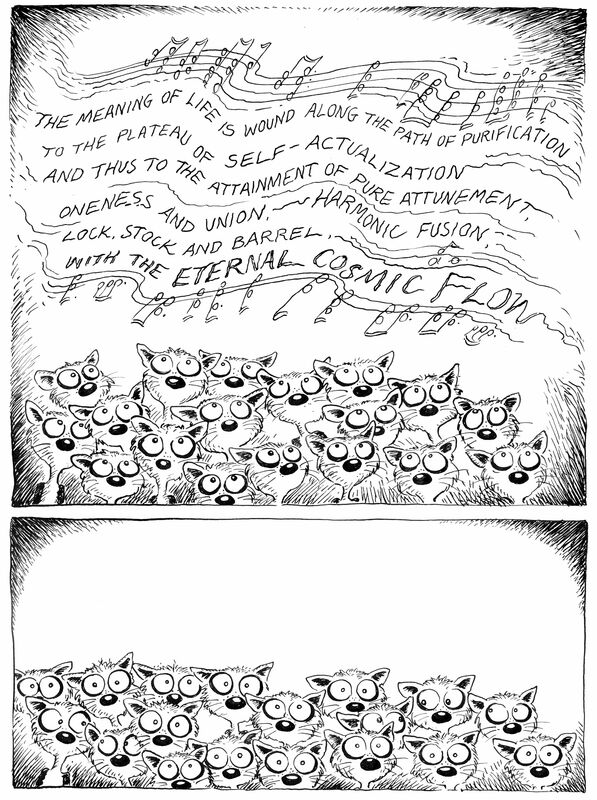 Many Meows until then. 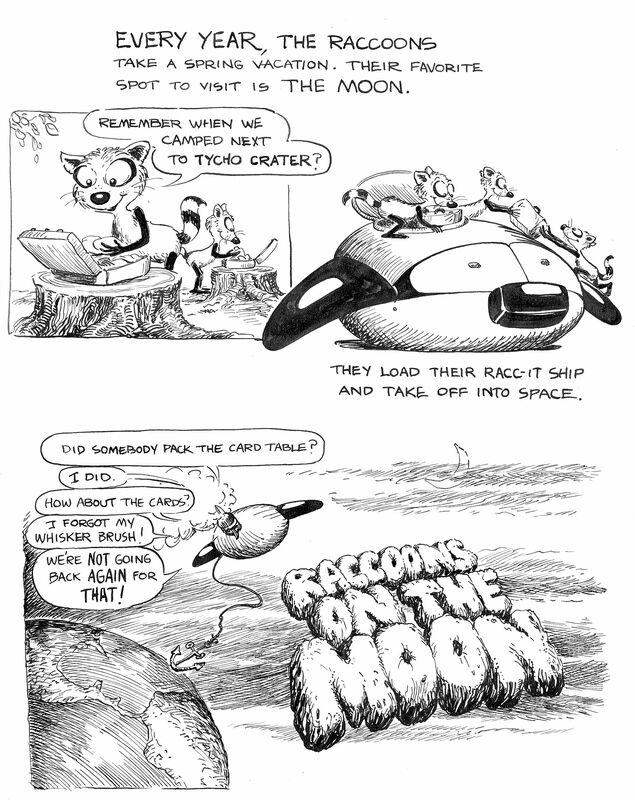 Here is the fourth episode of Cathy Hill’s Mad Raccoons in “Raccoons On The Moon”. 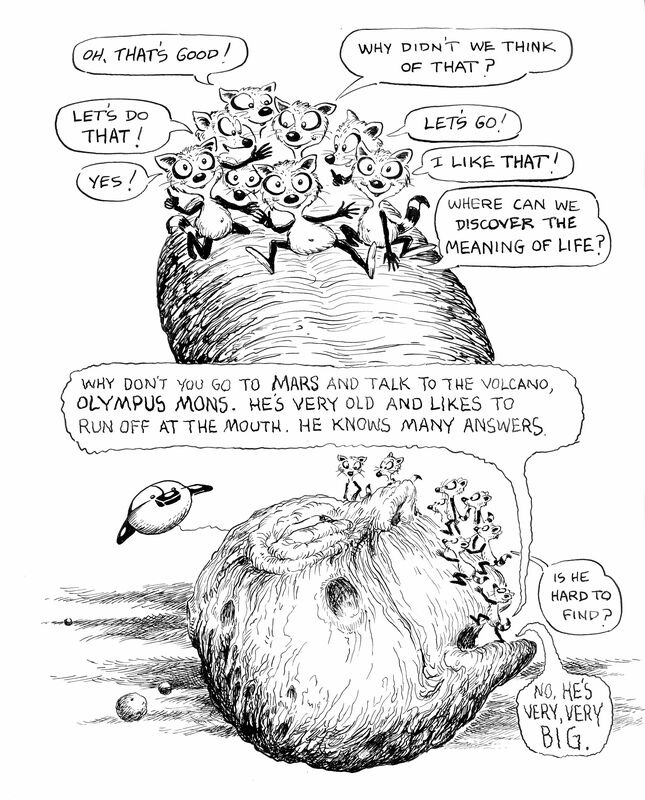 In the last episode, the Raccoons visited Mons Olympus crater on Mars and visited the lonely old lava, bubbling over with attempted jokes. In their search for the Meaning Of Life, Mons was very little help, so the Racc-it ship ventured over to Titan, one of the moons of Saturn and intercepted Halley’s Comet. The Old Dirty Snowball didn’t have any clues to the Meaning Of Life either, he didn’t take Life seriously enough to be helpful. He tosses the Raccoons another clue: the Meaning Of Life is known by the Windsongs of Neptune, on the Singing Plains of Neptune. So we leave the Silver Masked Tenors (Raccoons) on the Singing Plains until the concluding episode, next time. 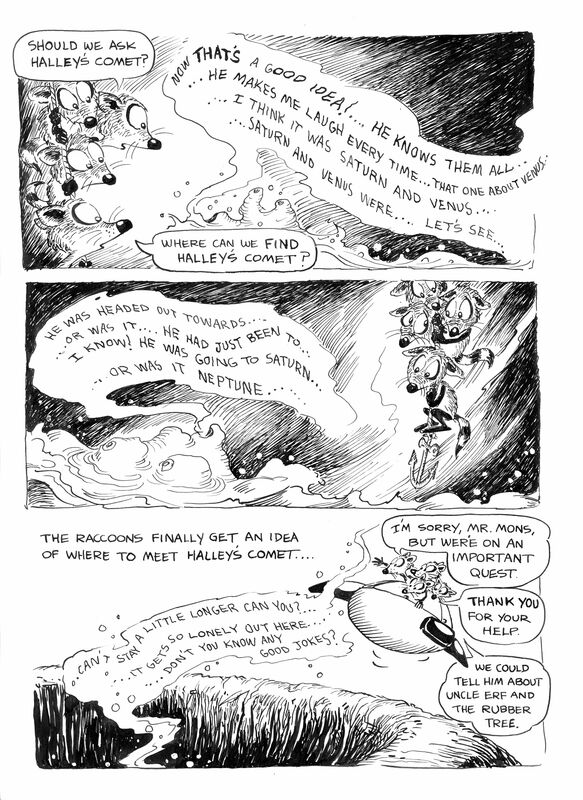 I love the drawing and delicate ink lines as Halley’s comet zooms through space, spats and all, and the Windsongs of Neptune speak in beautifully lettered words, resting on musical staffs. You can imagine the haunting sounds of their speech, as if in an astral echo chamber with John Cage tunes bouncing about. Here’s Felix from 7-3 to 7-9-1933. Felix is still the mascot of Danny Dooit’s team, the Midget Giants, but the team keeps racking up goose eggs, sometimes in the form of donuts. Felix is convinced he’s a jinx and a flop as a mascot, so he tries to talk Bill the Goat into taking his place. But Bill refuses, saying “All the games are lost, now you want me to be the GOAT!” In the Sunday, Felix blows soap bubbles with Mr. Dooit’s pipe to amuse Danny’s baby brother. Felix barely manages to keep out of Papa’s way as he’s still blowing bubbles in the last panel. This strip could have been the basis for an animated cartoon story, lots of chances for bubble effects. Myrtle is from 4-4 to 4-10-1949 this time. I like the continuity of the 4-4 through 4-6 dailies as Sampson tries to play his harmonica to amuse Myrtle’s Dad, Freddie. The 4-8 is a good gag with Bingo hitting up the Dog Pound for a snack, but the 4-9 is my favorite gag of the batch, as Myrtle puts on makeup for school and the teacher, Miss Flunkem is so impressed that instead of punishing Myrtle, she runs back to Susie’s house to ask Myrtle’s mom where she got the beautiful shade of lipstick! The Sunday has the usual inventive staging as Freddie tries to rescue Sampson’s kite from the top of a spindly tree. I like the little touch in the second panel as we just barely glimpse the neighbor’s shoe in the upper right corner, clinging to the roof. Krazy’s dailies this week are from 9-6 to 9-13-1943. Garge was thinking of Kate Smith and her theme song (“When the Moon Comes Over The Mountain”) in the 9-6 to 9-8. I love the drawing of the Moon squeezing under the mountain in the 9-6. 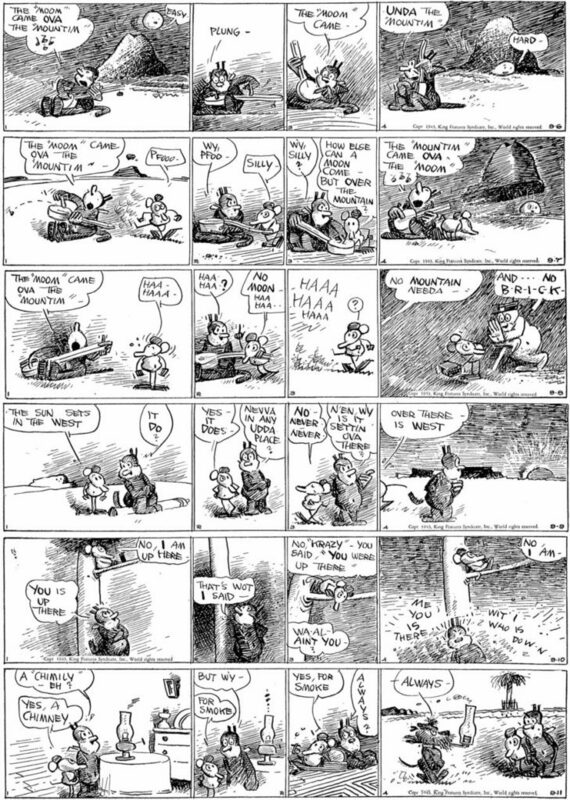 Garge gets a little obscure in the 9-10 and 9-11 strips as Ignatz mixes Krazy up with pronouns in the tree top and a little Scotty dog puts a lamp chimney over his pipe (for economy?). 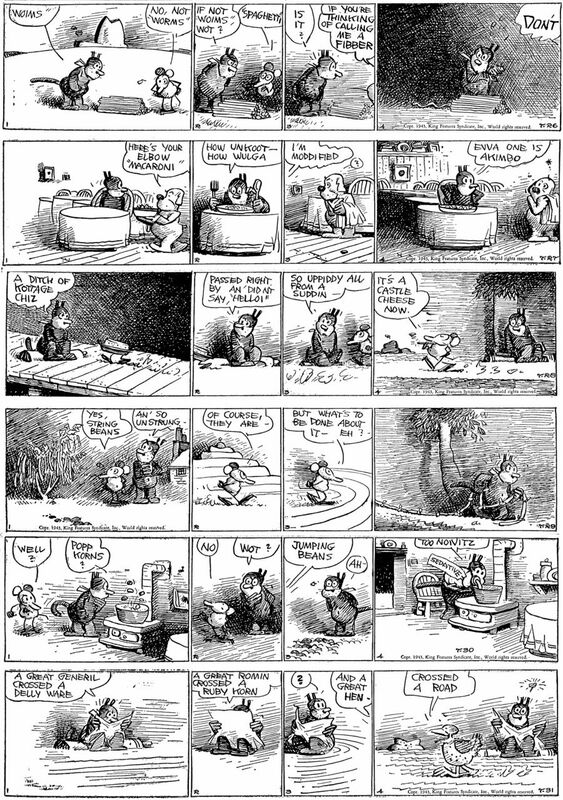 The 9-13 strip, in which the Kat sings, from the old song “Father, Dear Father Come Home With Me Now”: “The Clog in the Stipple strikes ‘One'” shows Herriman’s technique of scratching into the ink in the last panel, to create the white line of Ignatz’s tail. The 9-14 is pretty obscure as Garge refers to Russian pianists, as Pupp refers to himself as “Jasha Puppsha” and then runs off exclaiming “Ooy, Tchin-Dee!! 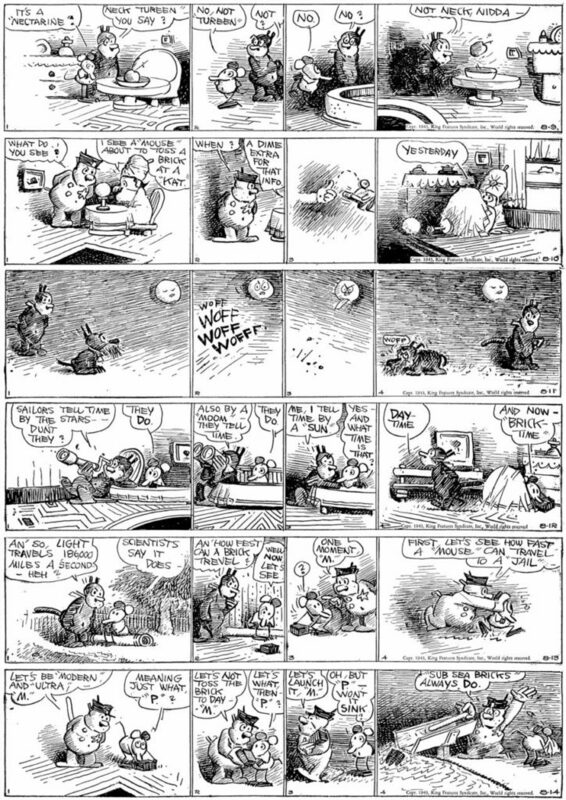 !”, frightened as Ignatz emerges from the top of the piano. In the 9-16, Krazy seems to speak “Ettskimmo”. 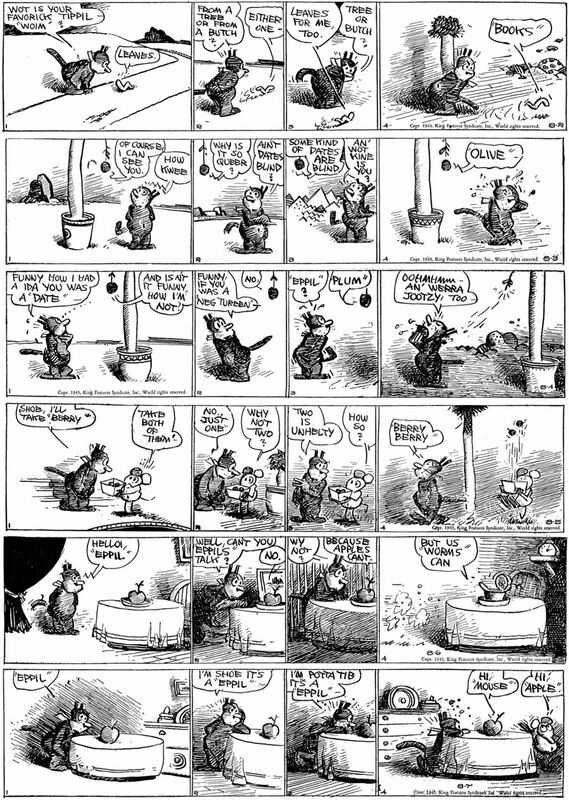 In the 9-17 Ignatz plays the bars of his Jail cell like a harp, and in the 9-18, Krazy trips up over sound-alike words as he confuses “Cane” with “Kane”. KURT KAUSLER R.I.P. My readers and friends, it’s very hard to tell you that my younger brother, Kurt, passed away on January 24th, 2019 in St. Louis, Missouri in front of his fireplace–his bulldog Gracie at his side. He lived to be 67. His dear girlfriend Linda discovered him there at about 8:30 AM, having left him at his house the previous evening at about 6PM. 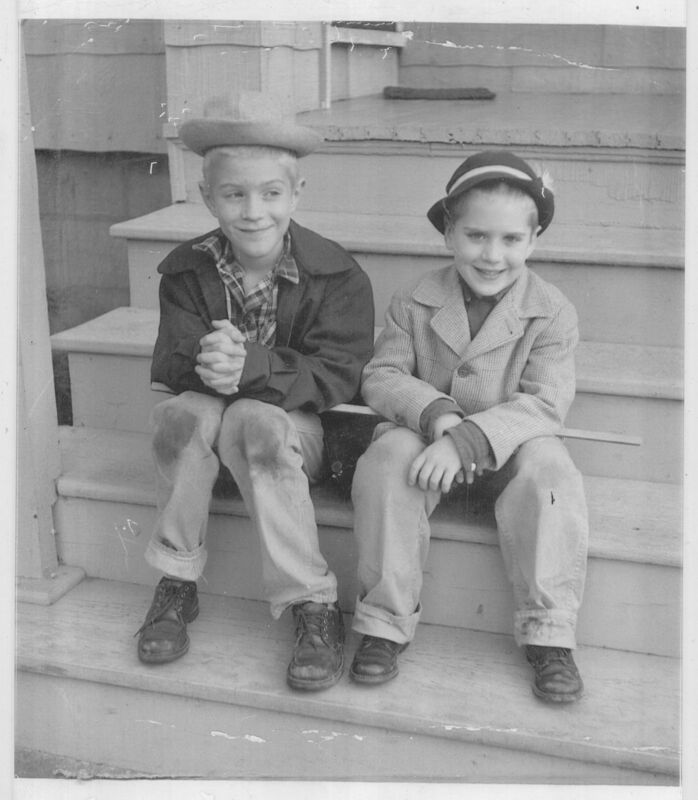 You can see by the photo above, taken about 1958, that Kurt and I were an odd couple of brothers. We may have been some of the “original geeks”–very fond of history, books, comic books and animated cartoons among many other things. We used to fight each other a lot as kids, inspired (to my Mother’s horror) by the Popeye cartoons shown on the local St. Louis TV program: “Cookie and the Captain”. Most of the fights ended when I sat on poor Kurt, being heavier than he was. Kurt was of a more serious turn of mind than I was. As you can tell from the photo. Look at his natty outfit, and look at my wrinkled, dirty pants with the soiled knees. I probably had Pinky Lee on my mind, with the pork pie hat, and Kurt may have had Clark Gable or Ronald Colman in mind with his neat hat with the little feather. Kurt ended life as a scholar, treasured by the family of James Hilton. The Hiltons told Kurt that he knew more about the famous author of Lost Horizon and Goodbye, Mr. Chips, than they did. Kurt spent years tracking down James Hilton’s early novels and arranging for them to be reprinted, and dug out just about every newspaper and magazine article Mr. Hilton ever wrote from library collections all over the USA and England. Even though Kurt was about three years younger than I, he was YEARS older in maturity, often giving me “fatherly” advice. He LOOKED older too, due to a case of childhood polio–which warped his spine just enough to put a small hump on his back. He often referred to himself as “Quasi”, and walked with a cane for years. The little drawing below is one of Kurt’s. 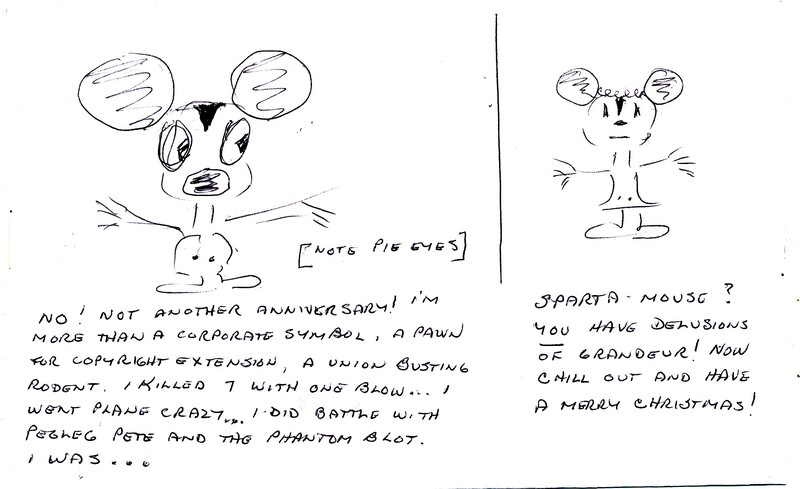 He did a long series of these, featuring his patented stick figure mouse characters. This was one of the last, drawn on a Christmas card envelope in 2017. The text reads: “You’re Kidding! There’s a model sheet? For US? Who else draws like this, Munro Leaf? And how come that idiot hunchback makes us look different every year? 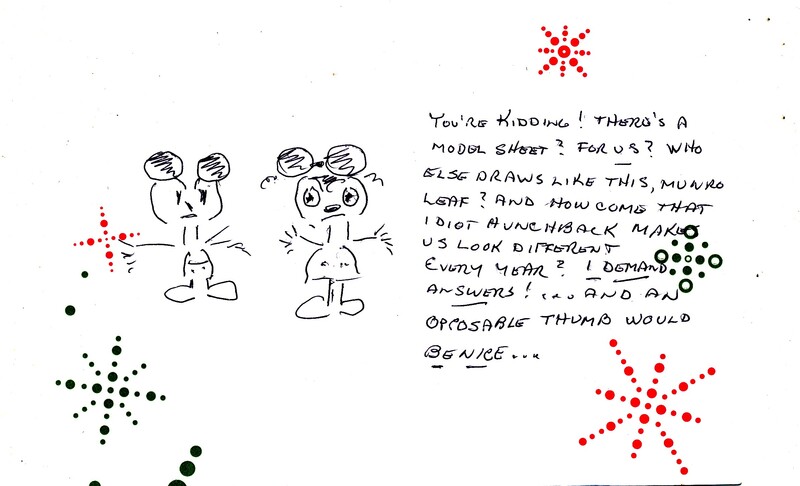 I DEMAND ANSWERS!…and an opposable thumb would Be Nice….” I think I drew a model sheet of “Mickey Mark” and wife for Kurt, sadly I don’t have a copy. (“Mickey Mark” was the name of the stick figure character and one of Kurt’s nicknames for me.) 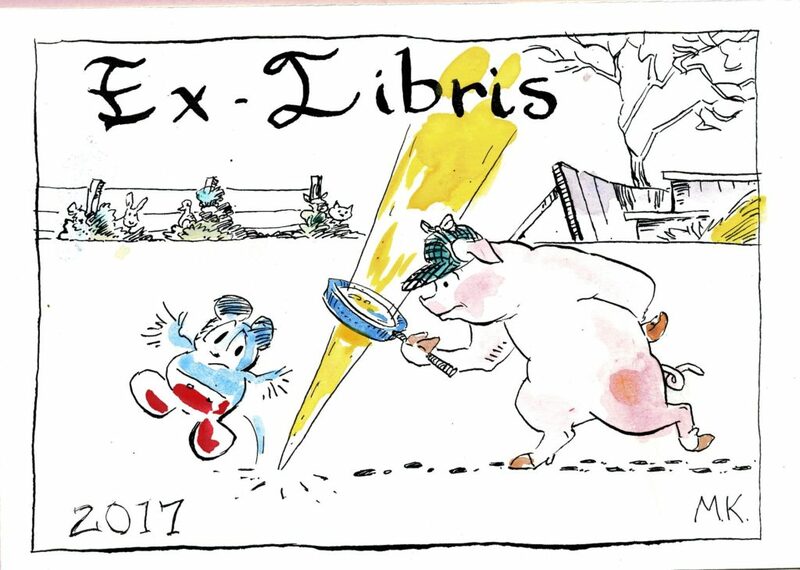 I also did a gag bookplate for him in 2017, featuring his stick figure mouse and Freddy the Pig, who was one of Kurt’s favorite children’s book characters (reproduced below). “Munro Leaf” was another children’s book author, who illustrated his books with simple matchstick drawings of children. “Manners Can Be Fun” and “Safety Can Be Fun” by Mr. Leaf are still in print; he also wrote the famous “Ferdinand the Bull” story which he DIDN’T illustrate. Kurt loved to make fun of himself, so he calls himself “an idiot hunchback” who couldn’t draw his mice the same way twice. 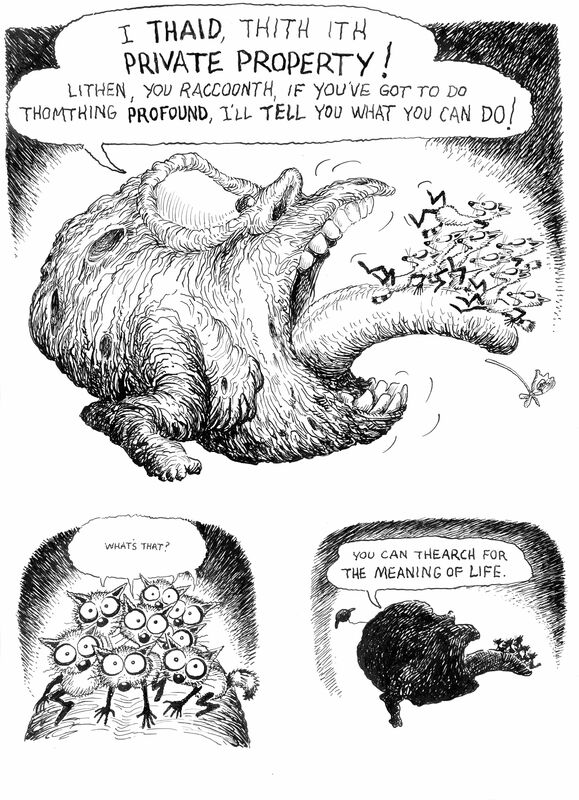 His comment “an opposable thumb would Be Nice…” is a slyly humorous admission that he couldn’t draw HANDS. Kurt was a very big part of my life. I already miss him more than I can ever convey, we shared so many likes and experiences. I will try to tell more anecdotes about Kurt in future posts, in the hope that the memories won’t completely disappear. Kurt was a “rock star” of a writer, as Linda Kraft (Kurt’s girlfriend) observed. He wrote beautiful English and did many articles about his heroes, Abraham Lincoln, Ronald Colman, Clark Gable and especially James Hilton. In spite of many health challenges, Hodgkin’s Lymphoma, polio, cancer of the neck and heart disease which required the installation of a defibrillator, Kurt kept as active as he could; doing yard work, and walking his bulldogs for miles. Rest in Peace my brother, I’m thinking of you and love you. There will be more stories about Kurt later, as the Catblog meows along. In honor of the recent landing of NASA’s InSight Lander on the Elysium Planitia on the planet Mars, the Catblog presents chapter three of “Raccoons on the Moon” as the Racc-it ship flies to Mons Olympus on Mars. Mons Olympus is a strange old man as Cathy Hill imagines him, who seems to have Alzheimer’s disease, and longs to hear a good joke that he won’t remember. 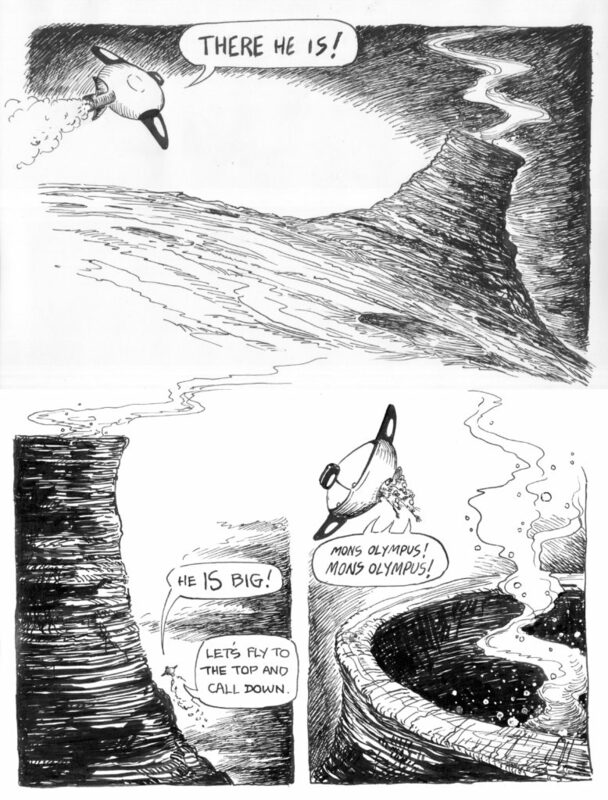 I love Cathy’s beautiful inking on these pages, every pen line seems to echo the extreme heat inside the volcano, and also the depth of the crater. There is a strong directional feeling to all the shading and cross-hatching. I love the panels on page two, as Cathy uses foreshortening and perspective to show the raccoons’ descent into the heart of Mons Olympus. 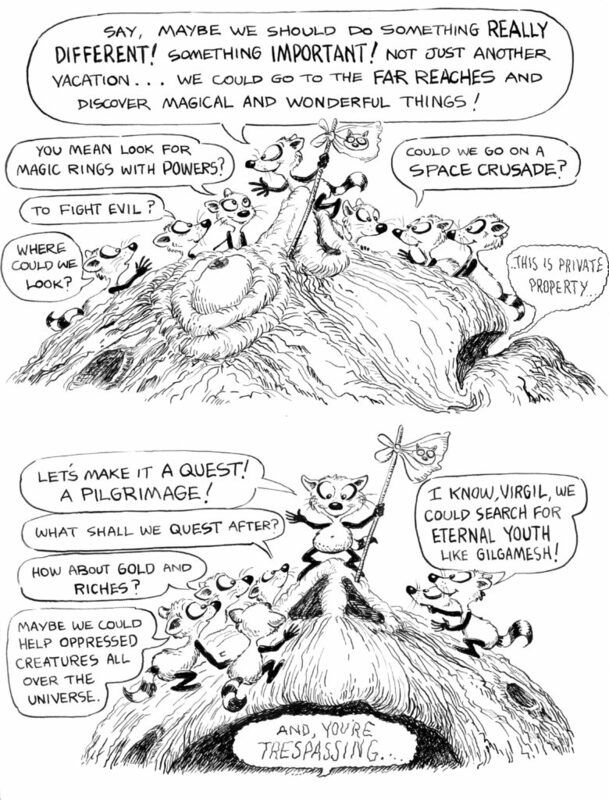 Mons has a humorous response to Virgil the Raccoon’s question: “What about the meaning of life, Mr. Mons?” To which Mons replies “How does it go? Just give me the first part….” I’ll have to find out about the joke about “Uncle Erf and the Rubber Tree” for next time, as the Mad Raccoons journey further into the solar system to find the meaning of life. Felix is from 6-26 to 7-2-1933 for this post. He continues to best the other animals in the competition to be the mascot of Danny Dooit’s baseball team. 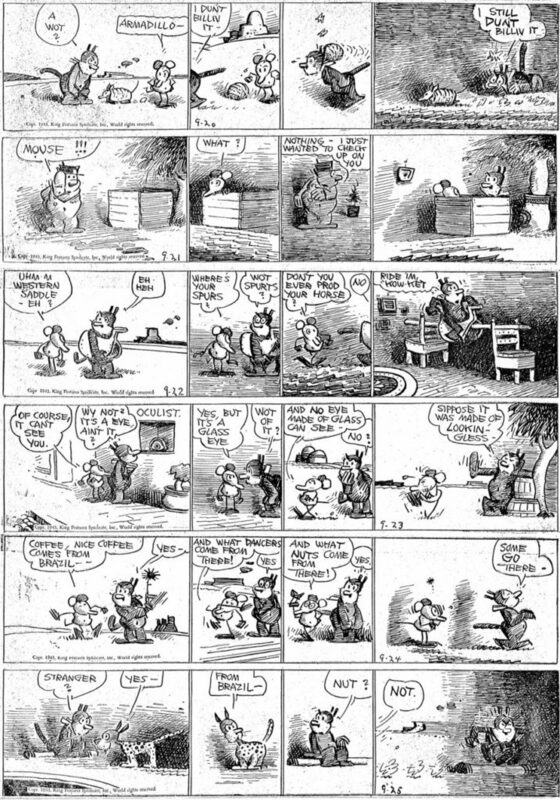 I love Otto’s rabbit and goat in the 6-27 and 6-28. The joke in the 7-1 is about the card game of bridge, in which the players sometimes kick each other under the table to signal how to bid, or how to make a play, hence the shin guards that Danny’s father appropriates for the purpose. The Sunday page features a helpful Felix, as the brainy cat helps Danny with an addition problem in school. Myrtle is from 3-28 to 4-3-1949. Dudley Fisher’s control of poses and rhythm in his through lines comes across in the 3-30 as Myrtle in a back view says “…I’m exotic!”, and in the 4-1 as she casually drops the telephone while luxuriating on the couch, as she tells Sampson, “No, I’m Busy!” Myrtle sometimes seems feminine beyond her years in strips like these. The Sunday page features Hyacinth the cat, curious about the contents of a purse that Myrtle has found on her family’s sidewalk. One of the neighbors comments about it: “There might be a little kitten in that bag! People do all sorts of things to get rid of little kittens!” Sad, but all too true. Don’t ever read Woody Guthrie’s “Bound For Glory” if you’re a cat lover, what they do to kittens in that book is a scandal to the catbirds. Lots of puns and Kat Langwitch wordplay in the Krazy Kats from 8-23 to 9-4-1943. 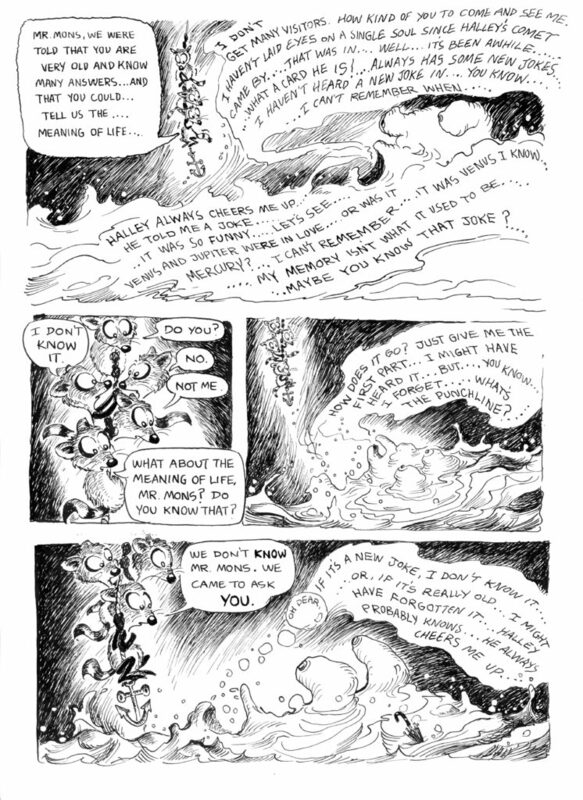 I like the 8-28, as Ignatz plants a candle under the Kat’s chair and Mrs. Kwakk-Wakk comments “Hot Foot” and Krazy answers “Sez You”. 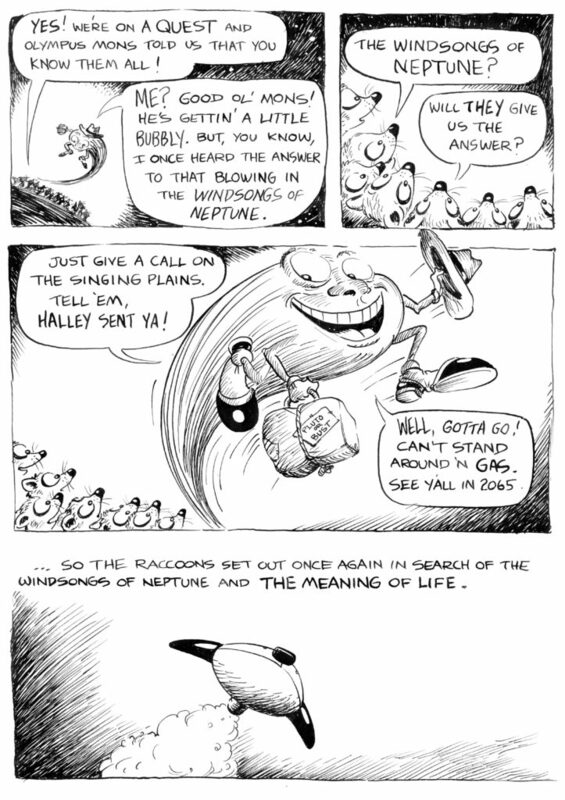 Herriman seldom uses exclamation points or periods in his word balloons, which gives a mysterious, hollow sound to the dialog. 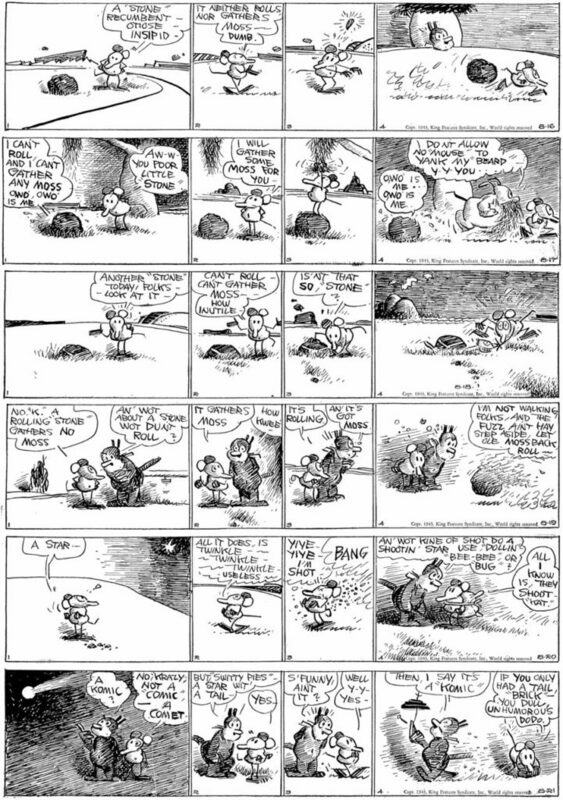 Offisa Pupp’s comment in the 8-31 about Ignatz: “Unbless his sour little soul…” has a poetic ring to it, and there is a Lewis Carroll feel to the Toad Stool joke in the 9-1. For more on George Herriman, click HERE. 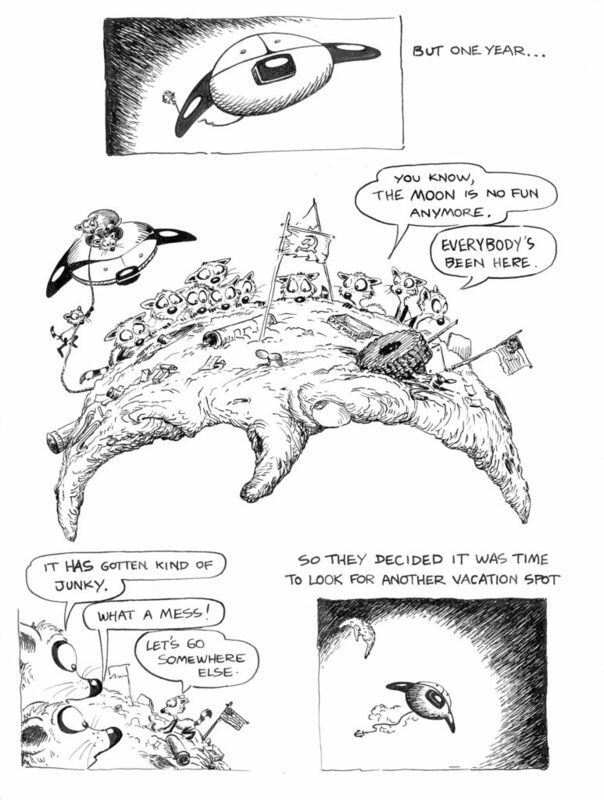 Have a wondrous Holiday Season, and the old Catblog will be back soon with the next installment of “Raccoons on the Moon”! Cathy Hill’s Mad Raccoons are back in Chapter two of “Raccoons On The Moon”, which I have titled: “The Lisping Asteroid”. In paying an inadvertent visit to the asteroid’s surface in their Racc-it Ship, the masked space voyagers find that the asteroid is alive! Not only alive, but possessed of a long tongue which the Raccoons stand upon, causing the Asteroid to speak with an impediment. 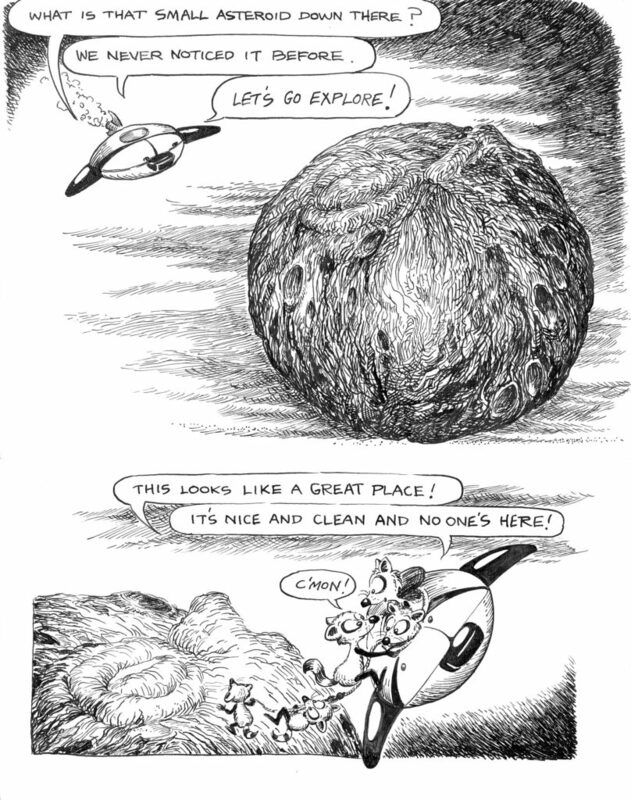 The asteroid directs them to visit Olympus Mons on Mars to discover the meaning of life. The next chapter should tell us more. 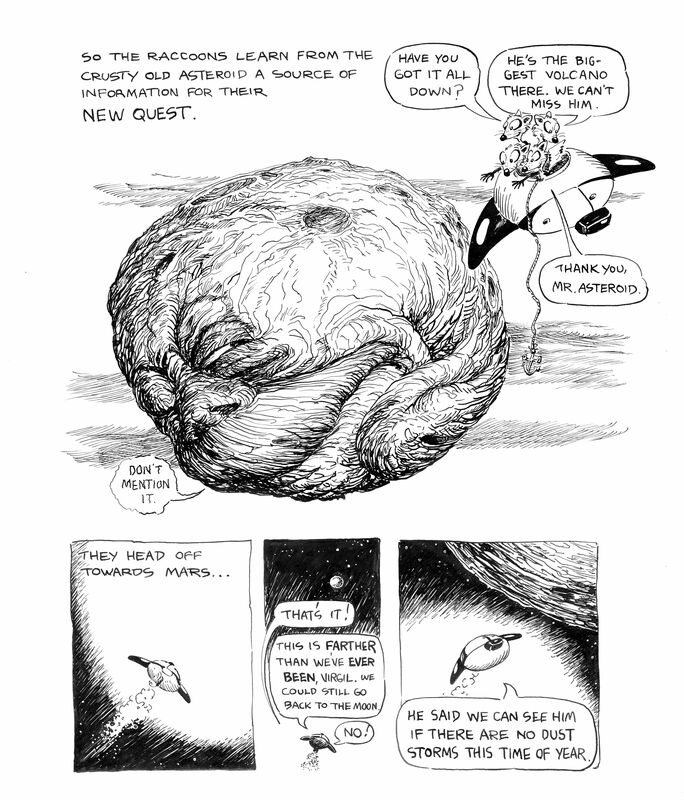 Cathy’s drawing of the asteroid’s face is full of character, cragginess and attitude. 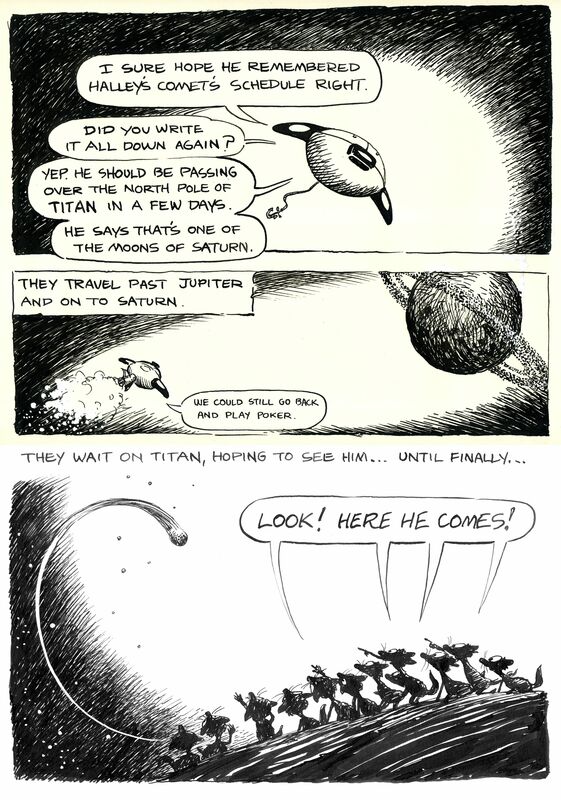 I love the many carefully placed ink lines she used to bring the space rock to life. Felix, from 6-19 to 6-25, 1933, finds him in a joyous mood, as school is out and he can play with his best friend, Danny Dooit all day! Felix tries to play in Danny’s neighborhood baseball team, the “Midget Giants” but one of the boys tries to swat him with a bat. Danny suggests him for the team mascot, but the rest of the team all have favorite animals up for the job. So Felix makes a democracy out of it. In the Sunday, Felix hides from the family dog by smearing his body with shaving soap and disguising himself as a French poodle. By the way, if you want to see the strips larger, just right-click the picture and select, “Open Link in New Window”, and it will pop up. I would assume you can do something similar in Mac. Myrtle, from 3-21 to 3-27-1949, is loaded with interesting ideas. Two favorites are the 3-22, as Myrtle is punished for talking to herself, only to find that her Mom is guilty of the same habit. The 3-25 has a touch of fantasy, as Bingo the dog tries to quiet Myrtle’s look-alike doll, who falls out of bed and comes to life, yelling “Waw!”. The Sunday page from 3-27 has a rare appearance by Hyacinth, the cat, as she sharpens her claws on the porch pillars as the rest of the cast try to hang a swing in a tree that hasn’t quite been planted yet. Krazy is from 8-9 to 8-21-1943 and spends the first week on Brick gags and most of the second week doing variations on the old saying, “A Rolling Stone Gathers No Moss”, which I believe was a moral in an Aesop fable. Two favorites are the 8-11, featuring one of Garge’s beloved Scotty dogs barking at the moon, and getting an attitudinal tongue stuck out at him from the astral stone. Somewhat similar in idea to the “Lisping Asteroid” above, eh? 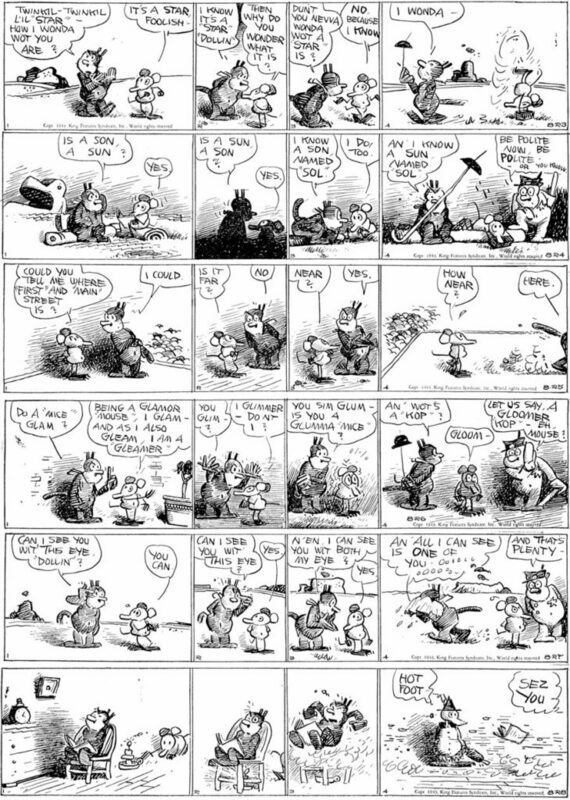 Garge slips us a little in-joke with the 8-21 strip. 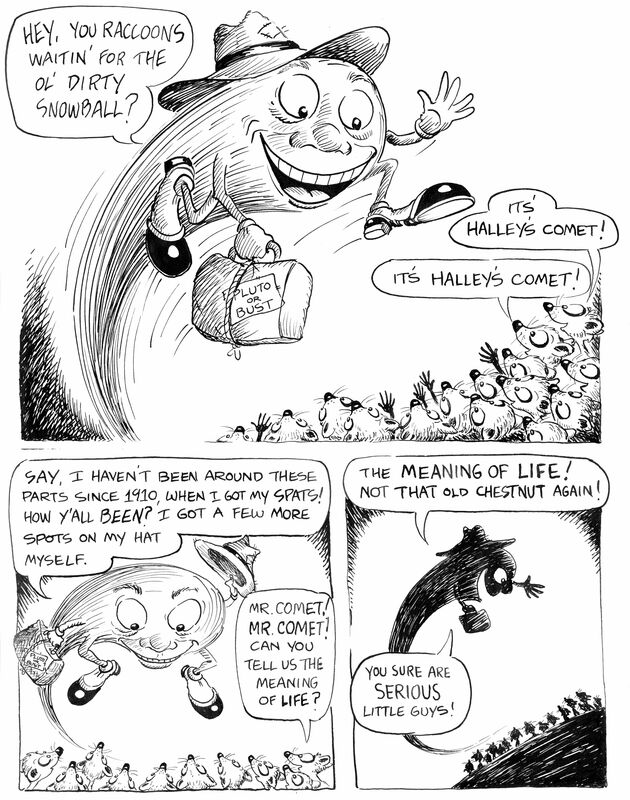 Krazy mixes up the words “comic” and “comet”, and turns the argument on its head by declaring that a “comic” is a Star with a Tail, meaning his/her self! 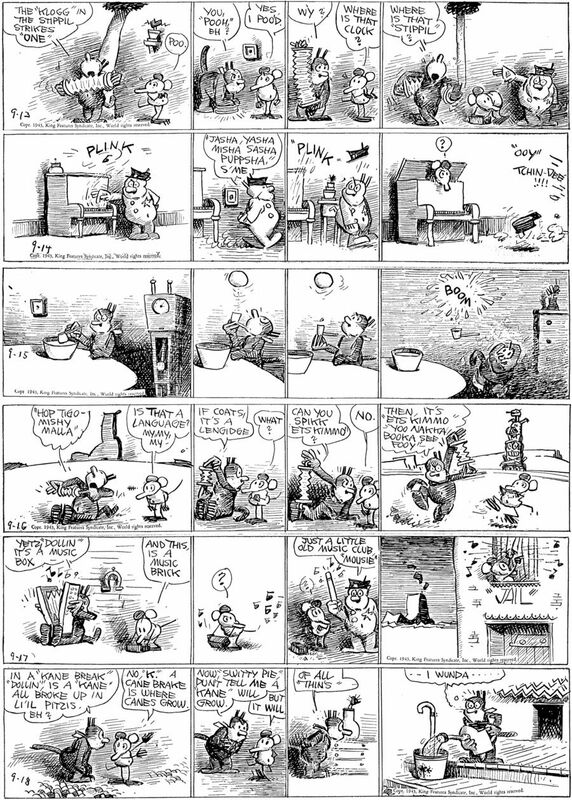 She leaves Ignatz talking to his brick, calling it a “Dull, Unhumorous Dodo.” Now remember to open the strips in another window, and we’ll open the blinds for you again next time. Racc-it Ship, si, Space-X, no! 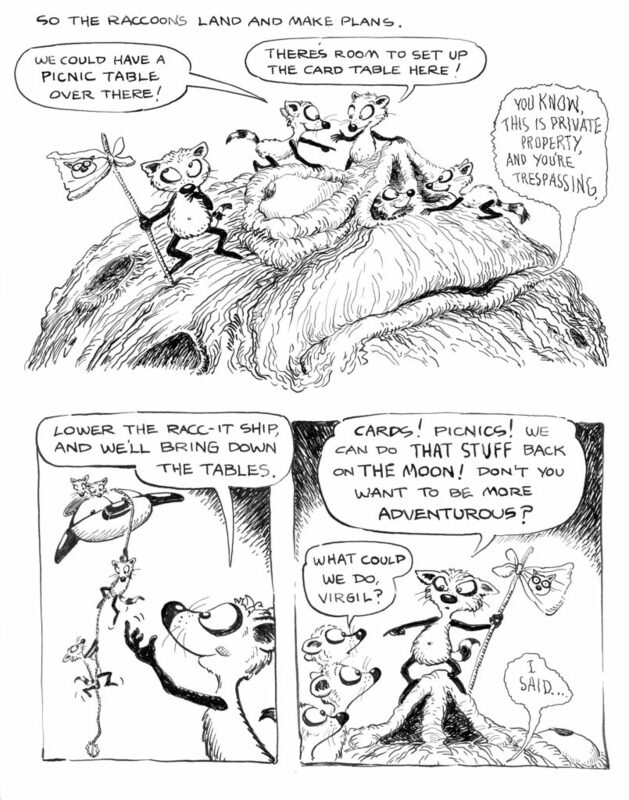 The Catblog presents an unpublished comic adventure of my wife Cathy Hill’s “Mad Raccoons”. 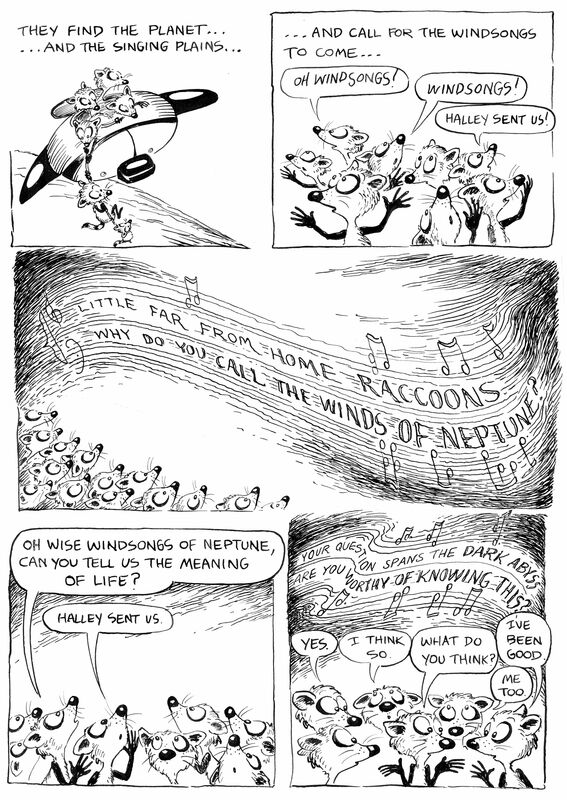 It’s called “Raccoons On The Moon” and runs twenty pages. We’re running them four at a time off the pen and ink originals. Cathy liked to do these sitting on the floor bending over the large pages of Strathmore paper. 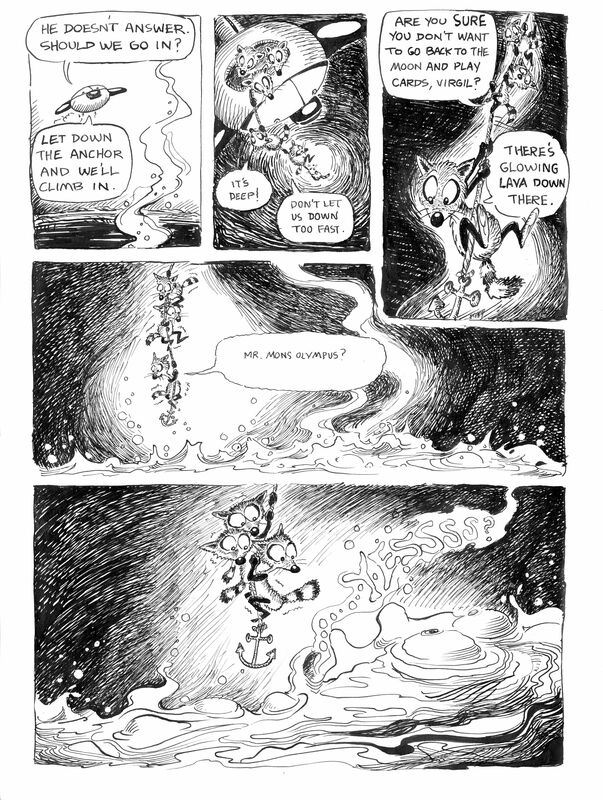 I love the beautiful ink lines she did and her rascally and adventurous Raccoon characters. She pencilled the stories lightly, in graphite or blue pencil, then inked right over them. 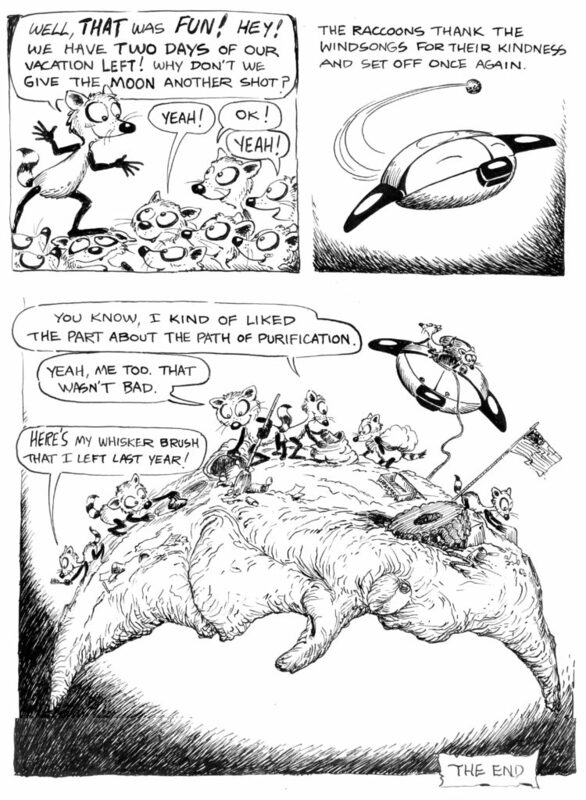 The “Mad Raccoons” comic book ran seven regular issues, plus a trade paperback collection of the first four. Mu Press put them out originally. If you search on Ebay, or better yet, at your local comics emporium, you will find them. Who needs Elon Musk when you’ve got Virgil Raccoon and his friends to take you to the moon and beyond! 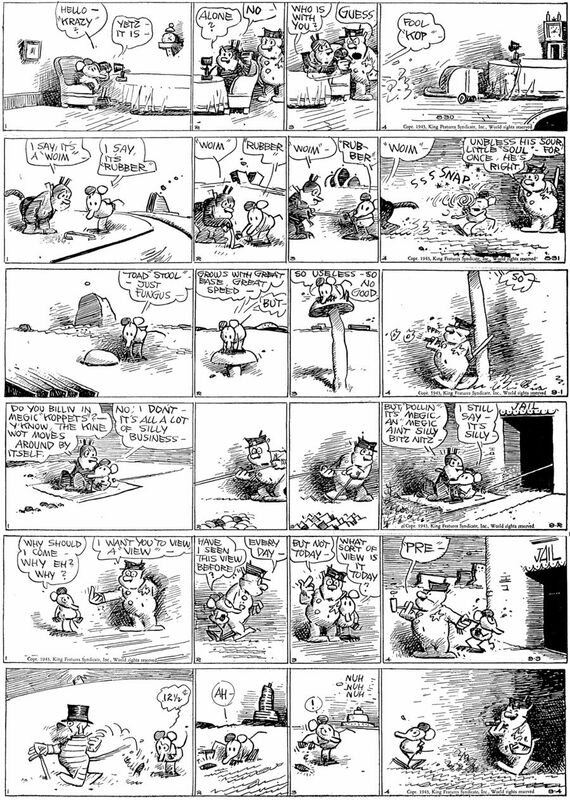 In the Felix strips from 6-12 to 6-18-1933, Felix saves Pop’s pants, but confidentially, they shrink! Danny thinks he has total freedom when school is out for the summer, until Mom needs help cleaning house, and Felix poisons himself with bug spray. In the Sunday, Felix is homeless again, until an errant baseball strikes a big bully in the head. The little boy playing baseball runs home to Dad, but the big bully pursues him and bangs on Dad’s door until his hands are a bloody pulp. Dad, who is a Doctor, fixes the bully up and Felix has a new home! Here’s Myrtle from 3-14 to 3-20-1949. A character with an unlikely name is off stage in the first two dailies. His handle? Lemme Kissue. Susie, Myrtle’s mom, soon puts a stop to the antics of this errant kid. The 3-18 is funny, as Myrtle’s doll receives a flea-ectomy from Sampson. The Sunday page is the usual delectable Dudley Fisher layout, as Freddie is drafted into the presidency of the Garden Club. Hyacinth is no where in sight this time. Food gags abound in Krazy Kat from 7-26 to 7-31-1943. Krazy’s Kat Lang-witch is truly delicious, just read these aloud to get the true feeling in the dialog. I love them all, but the 7-28 is really charming as a cottage cheese gets “uppiddy all from a suddin” and becomes a “castle” cheese. Again, most of the gags in Krazy Kat from 8-2 to 8-7, 1943 are food related. I love Krazy’s words, “Neg-tureen”, “Werra Jootzy” and “Potta Tib”. Is Krazy from Brooklyn or the Bronx? Tell me, New York readers! Sorry it’s been so long since the last post, maybe we’ll be more regular now that we have real, unpublished Raccoon comics to see.